What can you do with a yearling? There are many things you can do with a yearling, but in this article I will only be discussing five of them. Whether you plan on keeping your yearling or selling them it would be in your best interest to get them started on the things listed in this article. 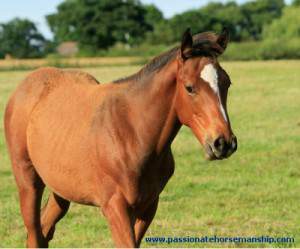 A yearling with a good foundation will be much easier to handle and will have more value if selling them. Getting their training started will make a difference when you start them under saddle or train them to pull a cart. This applies to all breeds of horses from miniatures to draft horses. If your yearling does not lead well that would be the first thing to start with. When they are leading well you can then start to work on tying them, but make sure you don’t tie them solid. You don’t want to tie them up to something solid because if they decide to pull back they could do a lot of damage to their neck, head or worse yet they could get so violent that they hit their head hard enough to cause death. The other things you will want to teach them is backing, moving the forequarters and hindquarters away from you and being able to touch them everywhere. Teaching the yearling to carry something on their back won’t hurt them at all. Get them use to carrying a saddle pad, but introduce it slowly as you don’t want to get them scared of it. Let them smell it before you ever put it on them. You can tuck the saddle pad under your arm on the side they are on and lead them around. When the horse feels confident about the saddle pad then rub them with it like it was a brush and before you know it you can put it on them. The first few times you put the pad on their back you might want to hold on to it if you lead them around because if it falls off it could really scare them. This is something that the yearling should have experienced as a weanling with their Dam, but a lot of times people wait until they are older which can be a challenge. Before you try this, make sure your yearling is leading well. If your yearling has never been on the trailer don’t try to get them into the trailer instead get them walking over a solid piece of plywood or on a bridge. When your yearling is confident with walking onto an obstacle then you can start introducing them to the trailer. Go slow and don’t rush them otherwise you could cause the yearling to be a problem loader. Taking your yearling places is a great way to expose them to different environments and build their confidence plus it gets them use to going in and out of the trailer. When taking your yearling to different places make sure their immune system is strong as you don’t want them getting sick. Some people choose to do traditional vaccinations while others use homeopathic nosodes for their yearlings vaccines. Taking your yearling through an obstacle course really helps build their confidence. You don’t have to have anything fancy for the obstacle course. Some of the things you can do is get them going over a bridge, walking over a tarp, backing between two poles, walking over ground poles, or weaving around cones. Would you like help with your yearling? Contact me today to set up lessons.